Lynk & CO plans to start European sales of its first model -- the 01 compact crossover developed with Volvo -- in late 2018. That is the same time the brand aims to launch in the U.S. and a year after its debut in China. A decade ago the Chinese made a big push to try and establish themselves in Europe. It was a disaster. The first wave of cars had outdated designs and technology as well as powertrains that weren't ready to meet Europe’s tough emissions standards. The quality of the cars was subpar and, most worryingly, they scored terribly in independent crash tests. 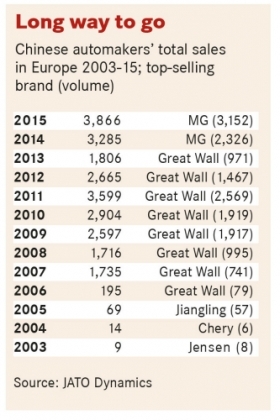 As a result, since 2006 Chinese brands have been a non-factor in Europe. Light vehicle sales peaked last year at 3,866 units in a market with a total volume of 14.1 million, according to JATO Dynamics. Most of those sales came from either MG Motor in the UK or Great Wall in Italy. Fast forward to 2016 and things have changed dramatically. Geely Automobile's Lynk & CO brand looks like it will be a serious contender when it debuts in Europe in two years because of the design and engineering help it is getting from sister brand Volvo. Meanwhile Borgward, a storied German brand revived with Chinese backing, also appears to be in position to succeed thanks to help from former Daimler executives as well as leading German suppliers such as Robert Bosch, Webasto and Schaeffler. With their forthcoming models, the two Chinese automakers will also try to tap into growing European demand for SUVs and alternative powertrains. Borgward's BX7 midsize SUV will only be offered with a battery-powered drivetrain while Lynk & CO's 01 crossover will be sold as a hybrid or a plug-in hybrid. Both brands plan to only offer vehicles with internal combustion engines in China. Borgward collapsed in 1961 after building about 1.2 million Borgward, Lloyd, and Goliath vehicles in Bremen from the 1920s. In 2018 the company will re-start production in Bremen, where it will assemble the BX7 (shown) from kits sent from China. The brands have also either committed to building vehicles in Europe or have the possibility to do so. Borgward, once Germany’s third-largest automaker, in 2018 plans to start assembling 10,000 BX7s a year from kits shipped from China at a factory in Bremen, its former home. "Production will be designed to be flexible and organized in such a way that we can adjust – and thus increase – production output and the number of models," Borgward CEO Ulrich Walker said in a statement. Walker is Daimler's former China boss. His team includes Tilo Schweers, who is now Borgward's head of powertrain electrification after playing a key role in Daimler's development of alternative drive systems, and Florian Herbold, who leads Borgward's transmission development after holding a similar job with Daimler. The Lynk & CO 01 will be underpinned by the compact modular architecture (CMA) that Geely developed with sister brand Volvo Car Group. Volvo will use the CMA for its 40-series compact cars, which will also be built alongside Lynk & CO models in China. Volvo's factory in Ghent, Belgium, will also produce vehicles using the CMA platform, which has led to speculation that Lynk & CO cars would also roll off the lines there. This is because the combination of transportation costs and tariffs would make it difficult for Lynk & CO to make money on its European sales unless the cars are make locally. Volvo said that there are no current plans to make Lynk & CO vehicles in Ghent. Even if Lynk & CO shipped China-built cars to Europe it is likely customers would give them a chance. A number of well-established automakers have proved that the quality of cars made in China is on par with models made in Europe. Most left-hand-drive versions of the Honda Jazz sold in Europe are built in China. In addition, the China-made long-wheelbase version of the Volvo S60 that is exported to North America has achieved a top rating from the U.S. National Highway Traffic Safety Administration. This success helped convince Volvo to make China its exclusive global export hub for its S90 flagship sedan. The S90 was previously made only in Sweden. Another advantage that both Chinese firms have is the support of an owner with deep pockets. For Lynk & CO it is Chinese billionaire Li Shufu, whose Zhejiang Geely Holding Group also includes Geely and Volvo. Meanwhile, Borgward is part of state-owned Chinese truckmaker Beiqi Foton Motor. Despite all the pluses, market watchers – as well as Zhejiang Geely's Li -- remain cautious because of the problems Chinese brands have experienced in the region and because Europe is considered the most competitive market in the world. "We don't have the ambition of influencing the whole European market," Li said. Added IHS Markit analyst Namrita Chow: "Both Lynk & CO and Borgward allegedly have solid financial bases behind them, but they have yet to launch products in Europe, with linked dealership and aftersales services." Robin Zhu, a senior analyst at Sanford C. Bernstein in Singapore, views Lynk & CO's and Borgward's export plans as a way to prove to Chinese consumers and the local government that locally made vehicles are no longer inferior to those made outside the country. "There is a huge desire on the part of the Chinese government to create an industry champion, and to have something they can export with pride. I think Lynk & CO will definitely try, I have less clarity on Borgward, but perhaps it's possible too," Zhu said. Christoph Stuermer, global lead analyst for PwC Autofacts, said Chinese automakers will only succeed in Europe if their designs are compelling and their brand history is interesting. "Lynk & CO is trying to stand out by using design cues from many premium brands, while Borgward is using its German heritage to make a difference," he said. One thing Lynk & CO and Borgward have in common is a strong focus on Germany, which is Europe's largest car market, accounting for nearly a quarter of the region's sales. Borgward says that it chose to make cars in Bremen for both emotional and economic reasons, which include the northern German city's proximity to the Bremerhaven port, the availability of skilled workers and the region's strong supplier base. The automaker added that German component makers such as Bosch, Continental and Kuka will "play a major role" in the future assembly of its EVs in Germany. Batteries will be supplied by LG Electronics, it said. Borgward currently builds fuel-powered variants of the BX7 in Miyun, near Beijing. The German plant will be its first factory outside China as well as the European base from which it intends to roll out the BX7 EV and, later, electric and plug-in-hybrid variants of BX6 and BX5 SUVs. While it doesn't plan production in Germany and doesn't have Borgward's past connection to the country, Lynk & CO still picked Germany's capital, Berlin, for the unveiling of the brand and its first model, the 01, on Oct. 20. Lynk & CO Senior Vice President Alain Visser said Berlin was chose for a reason. "We clearly want to look our German competitors in the eye, showing them that we have the technology and the quality of a German-engineered product," Visser said. "Germany will be one of our first markets and a priority market." The Geely subsidiary plans to start European sales of the 01 in late 2018. That's the same time it plans to launch in the U.S. Both debuts are scheduled to come a year after Lynk & CO's launch in China. Lynk & CO plans at least five models, including a compact sedan, but the range could expand even further, Visser said. The company's hybrids will be fitted with either a 1.5-liter, three-cylinder or a 2.0-liter, four-cylinder gasoline engine that it will build in China under license from Volvo. 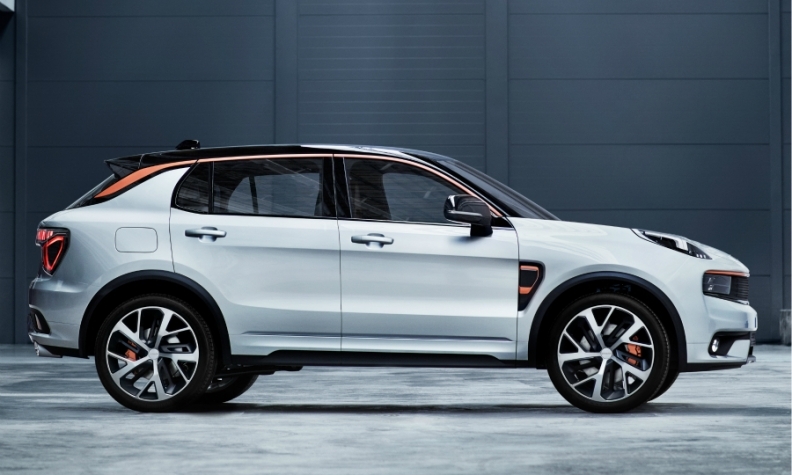 While Lynk & CO aims for annual global sales of 500,000 by 2022, the company would not specify sales targets for Europe or the U.S. IHS Markit estimates Zhejiang Geely's global production in 2020 will be 1.8 million units, with Lynk & CO accounting for 256,000 units, Volvo for 802,000 and the Geely brand for the rest. For Borgward, IHS forecasts global sales at about 73,000 units in 2020, with almost 90 percent of this volume coming from China. While Borgward has not announced yet how it will distribute its cars in Europe, Lynk & CO said it will place a strong emphasis on Internet sales while also building up a network of more than 500 company-owned dealerships. 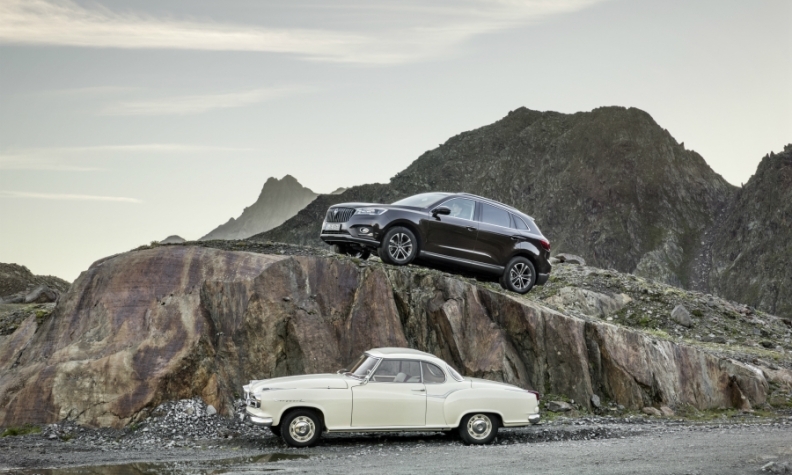 It will use Volvo's dealer network or independent dealers for servicing and spare parts. Visser said the business model for selling and servicing cars has not changed with the times. "The current car distribution model is broken," he said. In his view, automakers shouldn't "outsource" their sales to dealers because it robs them of margins as well as the opportunity to build up the brand image. "We want to control the entire process because we want to challenge every link in the distribution chain to enrich and simplify car ownership by redefining how cars are bought, owned, connected, serviced and used," he said. IHS's Chow said that Lynk & CO's plan sounds interesting, "but once again, the model has yet to be launched, either in China or elsewhere and it is only when it is put into practice that we will be able to see how fluid the system is." Direct sales work for electric carmaker Tesla Motors, said Sanford C. Bernstein's Zhu. But he believes it is because Tesla charges much higher prices than Lynk plans to charge. "As a 10,000 euros to 20,000 euros mass-market brand, I think Lynk & CO ultimately needs a physical presence to convince consumers that they are for real and will be around if things go wrong," he said. This will mean having stores in expensive megacities such as London and Paris as well as Europe's large metropolitan areas, he said. It will take years to see whether Lynk & CO and Borgward will succeed in Europe, ending a long streak of failures by the Chinese automakers that came before them. To do so, Sanford C. Bernstein's Zhu said it will be "very tough, much more difficult and much more expensive" than the brands could imagine. Zhejiang Geely's Li, however, remains positive. "I don’t see competition in a very complicated way," he said. "If we can reach or exceed the expectations of our customers, I think we can be successful." Lynk & CO and Borgward will have to overcome a great deal of skepticism in Europe because of the stumbles made by the Chinese automakers that proceeded them. Below are some the missteps. The Brilliance Zhonghua sedan and the Jiangling Landwind large SUV arrived in Europe in 2005 but were both pulled from the market because of their terrible performances in independent crash tests. "We have not seen such an unsafe car during the last 20 years," powerful German auto club ADAC said after testing the Landwind at the time. Great Wall Motors has been selling limited numbers of the Hover SUVs and Steed pickups in Italy and other countries since 2006. It has also built vehicles from kits in Bulgaria since 2012. Most of those vehicles are sold in Central and Eastern Europe. Qoros Automotive, which debuted with great fanfare at the 2013 Geneva auto show, recently stopped a pilot program selling its Qoros 3 in Slovakia. The trial was supposed to lead to an expansion of the brand throughout Europe. On the positive side, the Qoros 3 compact was the first Chinese-built car to receive a top score of five stars from crash safety rating group EuroNCAP. MG Motor, the former British automaker now owned by SAIC Motor, restarted European sales with its 2011 relaunch in the UK. It also resumed UK production that year. In September, however, SAIC said MG's UK output would end this year. MG will import fully assembled cars from China.